NT 271 764 The building is a substantial five-storey L-plan warehouse designed by James Simpson, built in 1891and extended by four bays in 1899. Both blocks share an impressive classical façade. Survey and analysis of cartographic evidence indicates that the warehouse incorporated the single-storied Queens Tobacco warehouse standing in the 1850s. The S block, which extends further back from Water Street, incorporates this earlier building. A contemporary two-stage wall screens the open courtyard at the rear. The main phases are both of the 1890s and each block appears to have operated independently in the first instance (with separate lift shafts). The interior details of design including the columns, floor and roof structure are identical in both. Little internal detail remains to indicate the nature of the original use, though the structure itself, built to carry a heavy load, is interesting in its own right. A 19th-century brick chimney, related to a boiler in the rear courtyard, was recently removed. The boiler probably heated the warehouse buildings. Evaluation of the site in 2002 (DES 2002) revealed that medieval and post-medieval deposits survived within the warehouse building. In April-June 2006 we therefore excavated 18 foundation pits in the present car park and 3 trenches inside the warehouse. In addition, the removal of the backfill of 24 column bases and the excavation of 2 pits inside the hoist shaft, within the building, were monitored and recorded. The results of the excavation give a picture of the development of Water Street from the medieval period onwards. The earliest phase comprised backland middens, possibly relating to Quality Street burgage plots, before the insertion of Water Street/Rotten Row. 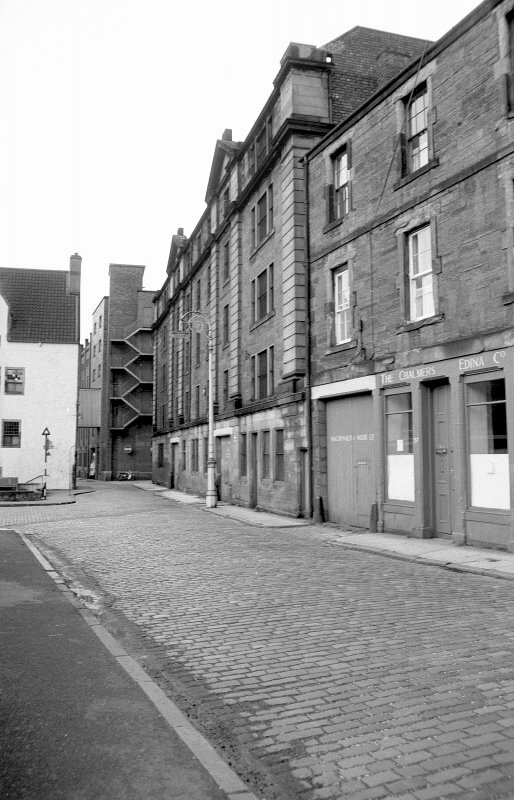 A number of small backlands buildings were then constructed, before going out of use, possibly when the streetscape was remodelled to allow for the insertion of a back lane (Water Street) in the 14th century. While there was no evidence for the early development of the Water Street frontage in the way of wooden structures, there were a number of possible medieval walls on the site, giving evidence for the development of the street frontage from the 15th century. No such structures were evident beneath the warehouse, suggesting that this part of the site may have remained undeveloped until later, or that later deposits had been truncated. The medieval walls appeared to have been robbed and/or re-used in the post-medieval period. This layout continued into the 19th century, as shown on the 1st Edition Ordnance Survey map. Archive to be deposited in NMRS. Reports lodged with Edinburgh City Council. Elizabeth Jones and George Geddes, 2006.